Not a lot is going on in the world of cider in April. Racking has passed, as has pruning. Bottling won't happen until May or June. Ah, bottling. The yearly worry of all small-time ciderists: will I have enough bottles? 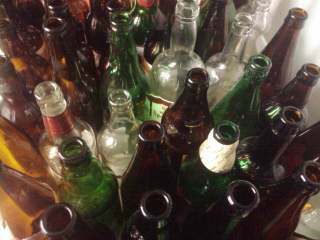 My Easter weekend was partly spent on a bottle-reckoning. All my various stashes of bottles brought together. Have I got the required couple of hundred bottles? Almost, and I have a couple of months to go. Maybe this year I'll avoid a last-minute bottle panic. I shared a bottle of the 2010 pressing with my wife at Sunday lunchtime. Very palatable and a lovely colour. And another bottle ready for the 2011 pressing of course.